To educate students on how to cultivate and maintain healthy relationships, Mary Kay Inc., loveisrespect and Everfi partnered to launch a Healthy Foundations program. The first-of-its-kind digital program was introduced to students and educators at Martin Middle School in Austin, Texas on Nov. 16. DALLAS – (Nov. 17, 2016) – To educate students on how to cultivate and maintain healthy relationships, Mary Kay Inc., loveisrespect and Everfi partnered to launch a Healthy Foundations program. The first-of-its-kind digital program was introduced to students and educators at Martin Middle School in Austin, Texas on Nov. 16. During a school-wide assembly, the digital course utilized evidence-based strategies to educate students on healthy relationships, how to communicate and how to resolve conflict. Students participated in a panel discussion featuring domestic violence experts and advocates. Panel members included representatives from Mary Kay Inc., The National Domestic Violence Hotline, loveisrespect and the Austin Independent School District. "As educators, we are always thinking of creative and effective ways to prepare our youth for the future,” said Monica De La Garza-Conness, Principal at Martin Middle School. 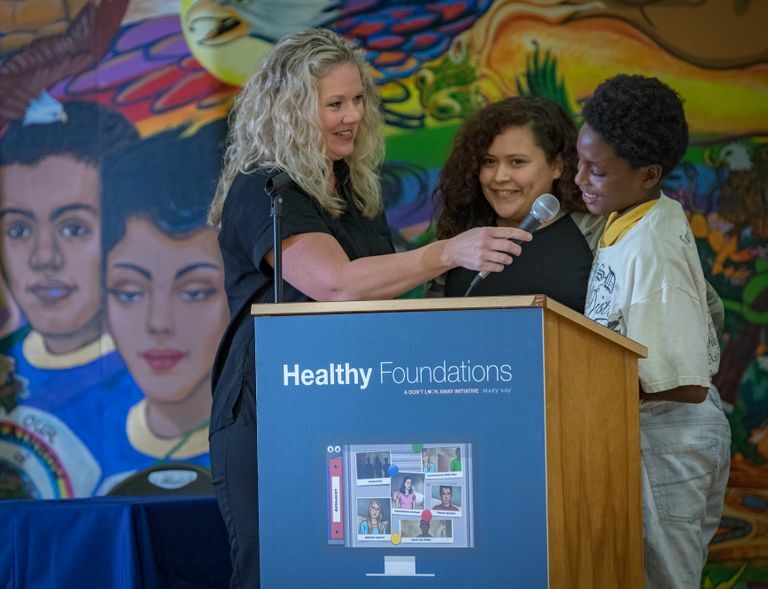 “Leveraging innovative technology, like the Healthy Foundations program, allows our students to explore situations that they may encounter, but in a way that is safe, self-guided, and interactive. Martin Middle School was truly honored to be the school chosen as the location for the launch." The Healthy Foundations program is part of Mary Kay’s Don't Look Away campaign which works to educate the public on recognizing the signs of an abusive relationship and how to take action. 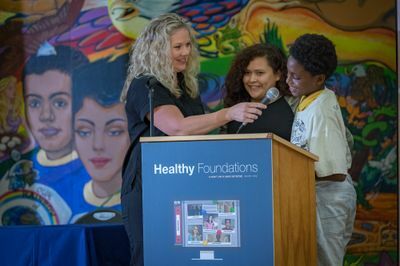 In addition to the digital course and panel discussion, the event also featured the unveiling of a “Don’t Look Away” mural developed by middle school students depicting the theme of healthy relationships. The mural will remain on display at Martin Middle School. To date, Mary Kay Inc. and The Mary Kay Foundation have given $53 million to domestic violence prevention and awareness programs in an effort to end the cycle of abuse. Mary Kay is also the lead sponsor of the nation’s first-ever text-based dating abuse hotline operated by loveisrespect. For more information about Mary Kay’s commitment to end domestic violence, click here. Loveisrespect.org is the ultimate source of support, tools and services to help young people prevent and end dating abuse, inspiring them to create a culture of healthy relationships. The 24/7 chat, text and phone crisis services and vast library of information provide young people with options, answers and support every hour of every day. Break the Cycle and the National Dating Abuse Helpline designed the program specifically for young people, emphasizing confidentiality and trust to ensure teens nationwide feel safe and supported – online and off. Find out more at www.loveisrespect.org. EverFi, Inc. is the education technology innovator that empowers K-12, higher education, and adult learners with the skills needed to be successful in life. Its comprehensive critical skills platform is focused on Financial Education, Digital Citizenship, STEM Career Readiness, Diversity and Inclusion, Entrepreneurship, Character Education, and Health and Wellness. The EverFi Education Network is powered by more than 3,300 partner organizations across all 50 states and Canada and annually reaches 6 million learners. Learn more at www.everfi.com.